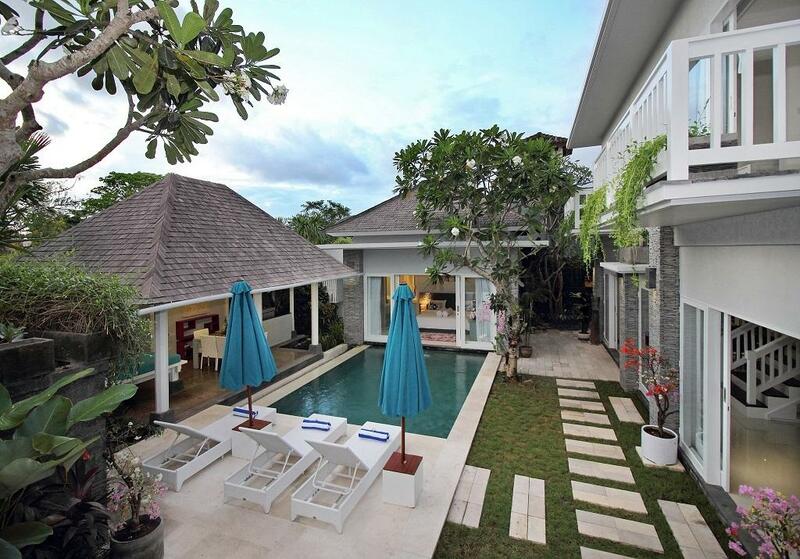 Looking for a fabulous and relaxing holiday, then Villa 3644 is the perfect answer for you. 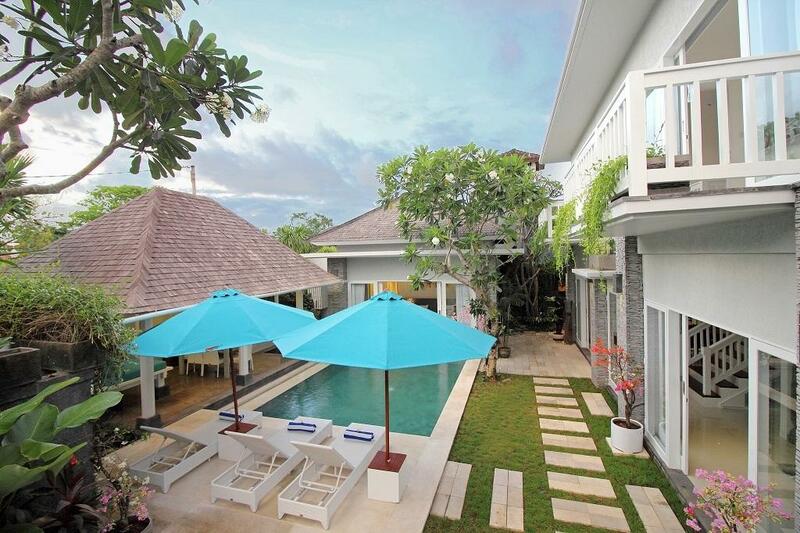 Villa 3644 is ideally located 250 meters to the beach, there is a bank, a day spa and mini mart all within 50 meters. Also within walking distance there are many quality restaurants in the same street as the Villa. 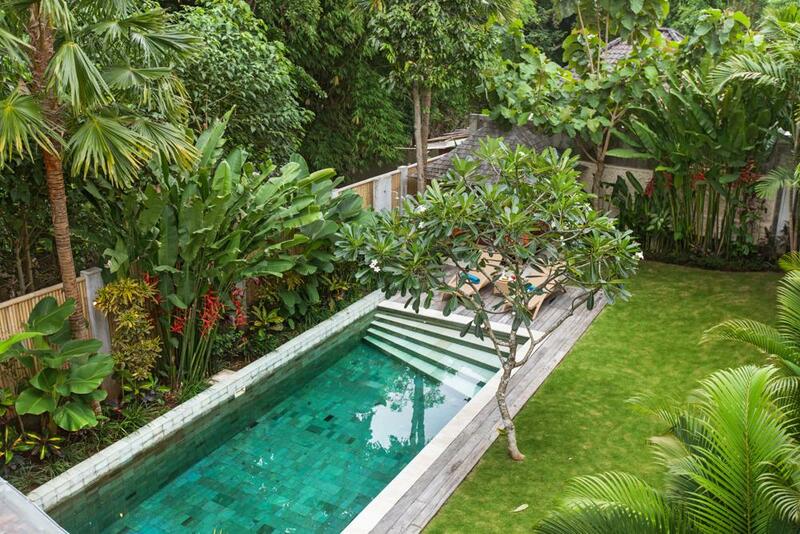 Designed in a traditional Balinese pavilion style Villa 3644 boasts clean contemporary lines with beautiful tropical gardens and water features and importantly the villa is very secure as it is a single standalone villa with high private walls. As a private villa there are no shared facilities as everything is within the villas own 500 square meters of land. 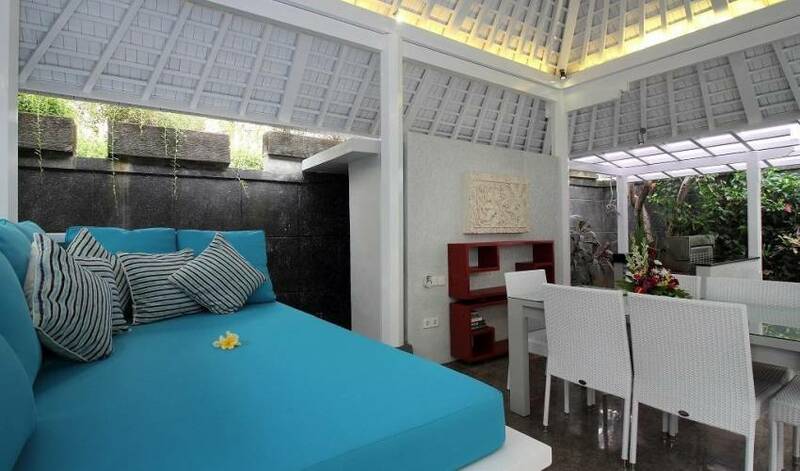 The villa has 3 large bedrooms each with their own en-suite bathrooms. Two bedrooms have king sized bed and the third bedroom has either 2 king sized singles that can zipped together to form a king sized bed. 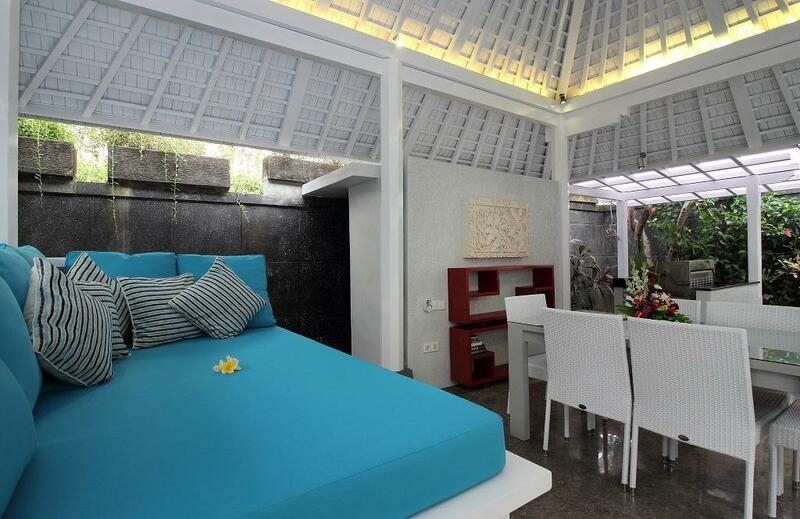 The Master Bedroom and Alfresco BBQ Pavilions are separate to the main two storey building. The two storey main pavilion includes a separate lounge room, kitchen and dining area on the ground floor and two (2) large upstairs bedrooms with their own en-suite bathrooms and toilets. All living areas and bedrooms are fully air conditioned. 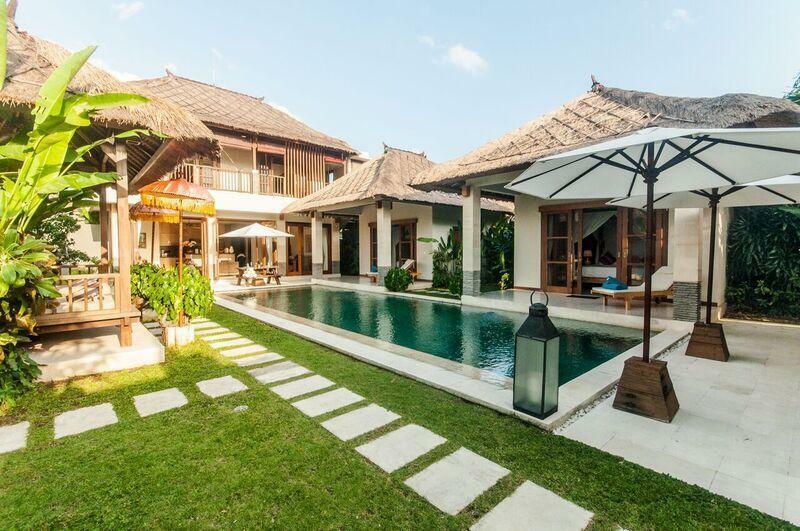 The Villa is fitted in a contemporary layout and features luxurious finishes and quality modern appointments which enhance the irresistible Balinese charm. 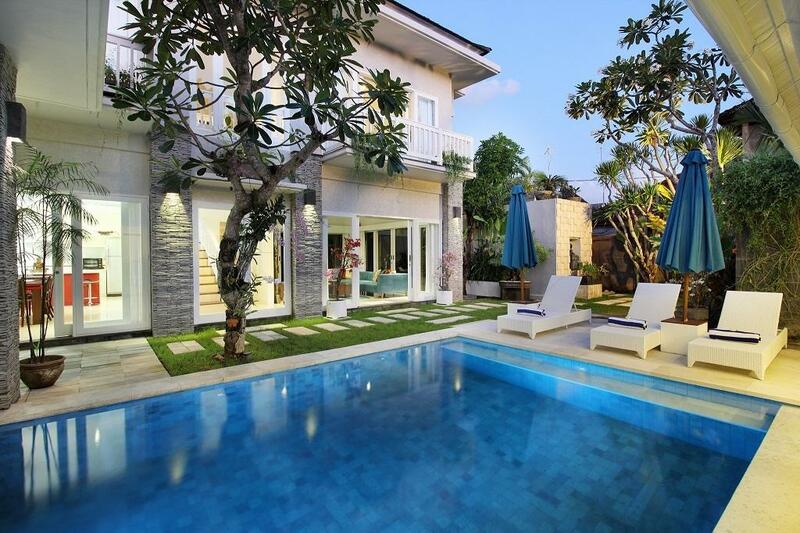 This very well appointed and comfortable villa is set in 500 square meters of tropical gardens with a generous 6 x 5 meter swimming pool, large pool deck complete with sumptuous cushioned pool lounges and umbrellas. A spacious day bed, which forms part of the large Alfresco/BBQ pavilion overlooking the pool is a great place to just lay back and relax with a new book. The six seater dining setting is a fabulous place to enjoy a casual alfresco lunch or tropical cocktail. It is possible to arrange for our chef to cook on the BBQ at poolside when you are not interested in going out to the many nearby restaurants. All of this compliments your holiday atmosphere and experience at Villa 3644. The living room is a spacious room that opens through sliding doors onto the garden and pool deck on the one side, lush garden area to the east and patio on the other. It is newly and tastefully furnished with a sumptuous large L shaped sofa, entertainment unit with large flat screen TV, DVD player and sound system with iPod dock. A separate powder room adjoins the lounge room, so guest using the lounge, dining and pool area are not required to interrupt the privacy of the bedrooms. 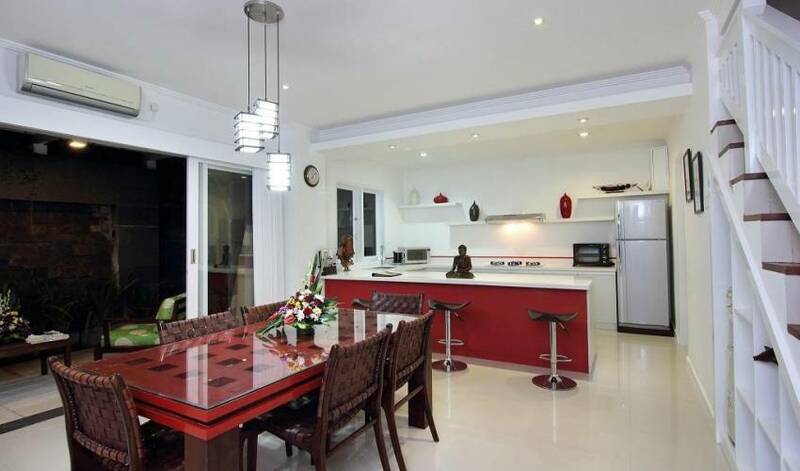 The Villa has a new modern kitchen, equipped with soft touch cabinetry, top class appliances, spacious preparation benchtop and is fully equipped with cookware, utensils, glassware etc. 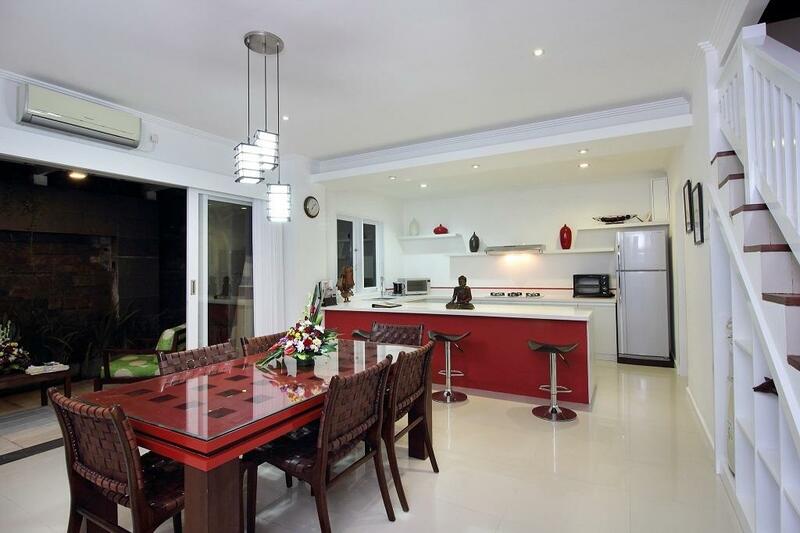 The kitchen has all you need to cater for your selves or allow our staff to do the cooking whilst you relax at the benchtop bar or adjacent dining suite. The dining area has a large dining suite that comfortably seats six and the area can either be open to the outdoors or closed and air conditioned. Adjoining the dining room through the large sliding doors there is a peaceful garden pergola/patio area with a gently running water feature, sumptuous lounge chairs and coffee table to allow you to relax and read or just contemplate the day ahead or past. 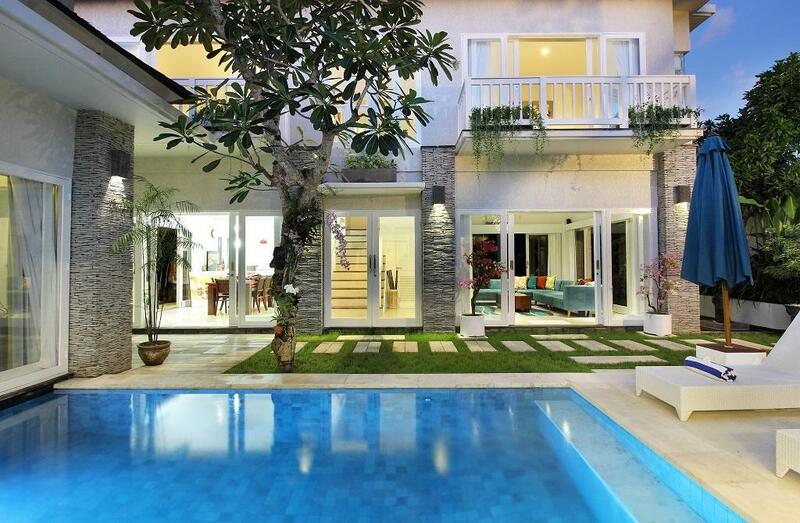 Villa 3644's three bedrooms all overlook the pool and beautifully presented tropical gardens. The Master Bedroom pavilion is at ground level and opens straight onto the pool. The master suite consists of an indoor/outdoor en-suite bathroom complete with stylish circular bath, twin vanity, shower and toilet all nestled in the bathrooms landscape garden. The bedroom also consists of a large King bed, large flat screen TV with DVD player, writing desk, twin robes, makeup desk and elegant finishes throughout. The upstairs bedrooms consist of one King sized bed and the other has two king single beds that can convert to a King bed if required. Each bedroom has sliding doors that open onto their own balcony with glimpses of the nearby ocean and it's inviting, gentle sea breezes. These spacious bedrooms are complete with their own large flat screen TV plus DVD player and also complimented by comfortably appointed marble en-suite bathrooms. All bedrooms, living and dining areas are fully air conditioned which will ensure a peaceful, restful and comfortable holiday. 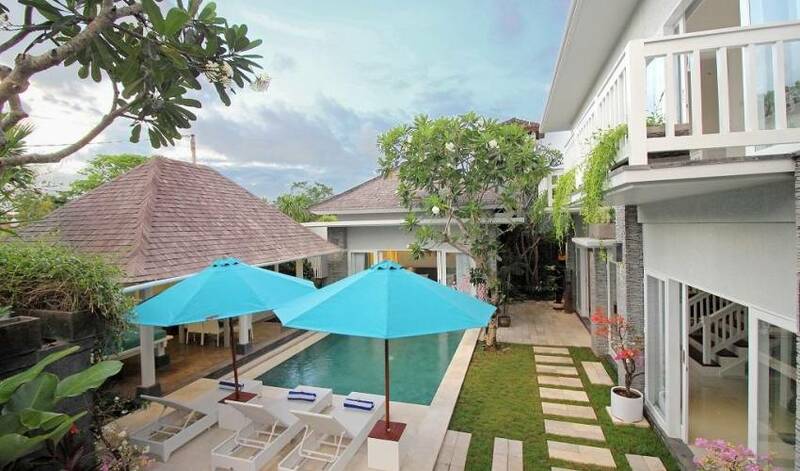 Villa 3644 is located a short 250 meters from Batu Belig beach and is ideally positioned to start your day with a walk along the beach or later an afternoon stroll to watch the famous Bali sunsets at one of the restaurants or bars on the absolute beachfront nearby. 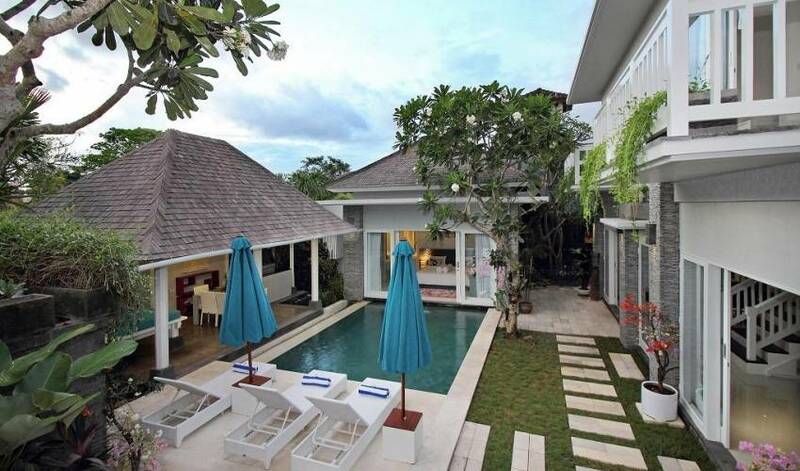 Some of the popular restaurant/bars nearby are La Laguna, Finn’s Beach Club, Bar 707 Batu Belig Beach, Hog Wild Restaurant, Watercress which are within 150 meters, Sobat, Slippery Stone, Sardines and Metis to name a few are in the same street as Villa 3644. 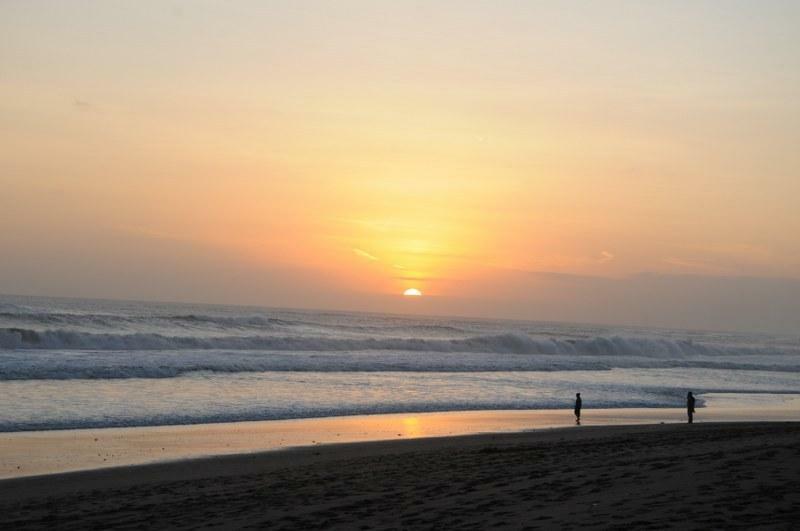 When you want to join the action, the trendy Seminyak shopping, restaurant and bar precinct, is a short 5 minute drive away. 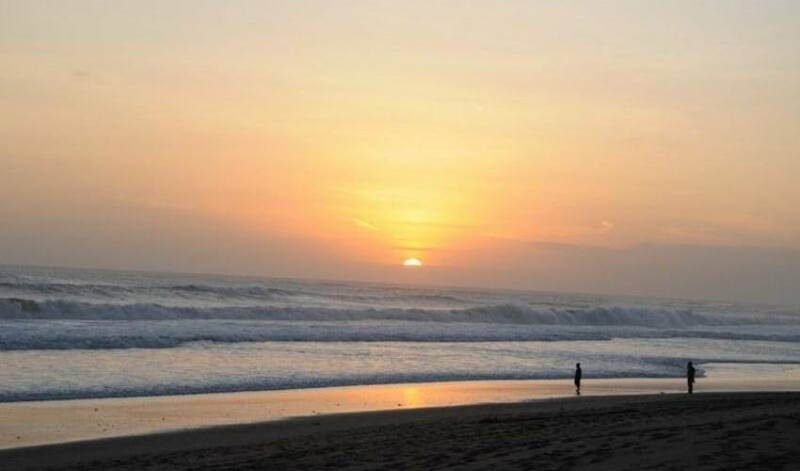 That is all it will take to get you to the long time Bali favourite La Luciolla restaurant, world renown lounge bar Ku de Ta, Potato Head bar/restaurant, Ultimo Italian International bar/restaurant and other iconic Bali day and night hotspots.